Montana has a nice ring to it so when the April 1987 issue of Ceramic Monthly came out with their list of summer workshops I zeroed in on the one in Missoula, Montana. The workshop was listed as a general pottery workshop with an emphasis on building and firing raku kilns. For weeks I prepared myself to travel from Clarksville, Tennessee to Missoula. My first stop was at my sister’s home in St. Louis for a three day visit with her and her family. I’d packed up my Honda civic, put my bike on the rear-mount bike rack and as I left my driveway I put my sunroof back and said goodbye to Clarksville for three weeks. Visiting my sister was great with a tour of the arch, evening talks with my sister and ping pong tournaments with my two nephews. The only stops I’d planned along the way were to stop and learn at each brown historic marker. There were many brown historic markers and sites along the way with a run-in with a coiled rattlesnake, a breathtaking five minutes with a newborn deer, a roaring mudslide that took out the road as I whizzed past. I’d given myself an entire week to reach Missoula which meant my route wound through quite a few states that aren’t really on the “direct” route to Montana. Reaching Missoula early in the day on my planned arrival date I drove around the city and was left smiling like an idiot. What a great place! I found a small cafe to have an early lunch and ended up staying for hours talking to people about the town, Montana and pottery. By the time I arrived at the workshop I was the second of four workshop participants and was shown a great apartment that I shared with one other potter. Bright and early the next day us four workshop participants were down at the tiny pottery looking over the wheels, tools and clay supply. We had almost three hours to get to know one another before the main potter for the workshop, Doug, showed up. He was laid back, happy to see us and said we could all dig into the supply of clay and get busy throwing and handbuilding pieces for our first raku firing in a week. Our first day was a delightful mix of anticipation, exchanged stories and experiences and working in the tiny studio and bright sunshine on the porch in front of the studio. Our second day we were told to be ready for a hike to locate local clay. What an adventure we had that day. We bumped and wound our way over back roads, stopping to look at interesting plants, animals and possible clay deposits. Our day was long and exhausting but we all ended up knowing a bit more about each other and rural roads! We found a few interesting bits of material to try out but no really exciting deposits of clay. This workshop was very loosely run and we could all come and go as we pleased. Making some interesting pots, learning about raku firing, glazes and building two raku kilns were the central focus. Most days we’d meet about 11 a.m. to work in clay, get a mini-lecture/demonstration and then work until about 7 p.m. If someone wanted to go for a hike, explore Montana for a day or stay in the tiny clay studio 24/7 then it was okay. The freedom was exciting and opened up a whole new way of working for me. I’d been so used to fitting in my clay work with all the other parts of my life I needed to balance. In the past I’d had my family, day job, dinner to cook, lunches to pack, etc. that it was unsettling to have complete freedom to work in clay any and all the time. During the next two weeks I made many pots, learned how to build and fire raku kilns and explored, hiked and camped in northern Montana. My memories of this time make me smile and remember someone on horseback riding through downtown Missoula, Doug instructing us while two dogs and a cat slept nearby, the laziness of a Montana afternoon and a cow nudging a small rock uphill. 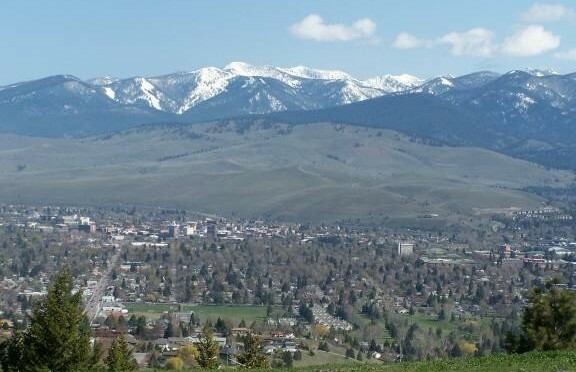 Missoula is a place to dream about and I’m not unhappy that my main memories aren’t of potting but of the general lifestyle and freedom I felt each day I spent in Montana.